Boston Whaler is launching a new superyacht tender, the new 320 Vantage, at the Miami boat show today. The new boat will become the biggest in the Vantage range, which so far has consisted of a 230 and 270. Boston Whaler says the 320 is designed for all-day comfort and has a roomy dual console layout with innovative seating options and amenities for every activity: fishing, watersports, leisurely cruising and more. At the helm, two touchscreens feature state-of-the-art electronics. The Vantage boats are designed primarily as standalone craft, but like many Boston Whaler models, they offer fantastic versatility, so serve also as potential superyacht tenders. The Florida builder is calling the 320 Vantage the next evolution in its popular dual-console series, boasting innovative seating and sophisticated design. Boston Whaler President Huw Bower will be unveiling the new model at the show, with Vice President of Sales, Marketing and Customer Service Jeff Vaughn. For those after a bigger tender, Boston Whaler will also be re-launching its largest and most advanced model, the 420 Outrage. The concept was unveiled at the Fort Lauderdale and autumn boat shows last year and since its launch has been winning positive reviews. 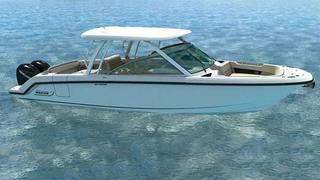 The builder is presenting it for the first time at a boat show during the Miami event, which runs from February 12-16. The 420 boasts an expansive bow with innovative seating that means it will double as a superyacht tender. There is a well-equipped cabin down below and there are sun-lounging and relaxing spaces at both ends of the boat, so perfect for a day away from the mother ship. The Outrage can be fitted with no less than four Mercury Verado 300s with Joystick Piloting, giving incredible power for a boat this size. The launches are among more than a dozen new models the company has introduced in the past three years and follow an expansion of the builder’s headquarters in Edgewater, Florida, which has grown by 58,000 square feet.